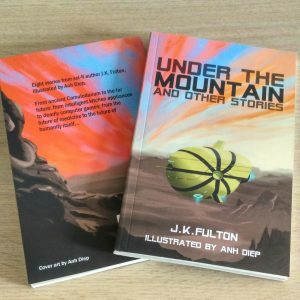 I’m delighted to announce that Under the Mountain and Other Stories, my collaboration with artist Anh Diep, is now available from Amazon. 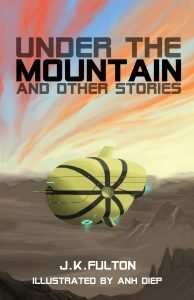 This is a collection of eight science fiction and fantasy short stories, including all three of my previously-published stories, along with five never-before-seen tales. Complementing the stories are illustrations by my friend Anh. He’s probably spent more time illustrating the stories than I have writing them! I’m in awe of anyone who can draw at all, as it’s a skill completely alien to me, and Anh has real talent. With at least one picture per story (there’s an extra bonus picture for Cold Black Heart), this is a genuine partnership, and we’ve agreed to split the proceeds 50/50. This publication is a departure from my usual Scottish children’s historical fiction, but in a lot of ways it’s a return to my origins. I’d always enjoyed writing, as long as I can remember, but it was reading Isaac Asimov’s account of his first forays into writing short stories for the science fiction magazines of the late 1930s that made me want to be a writer. Growing up, I had shelf upon shelf of sci-fi paperbacks, many adorned by covers painted by masters like Chris Foss. I badgered Anh with Chris Foss stripy spaceship reference images while we were working on the book, and even though he prefers drawing human figures, he relented and produced a fantastic cover that shows the influence of Foss while being still unmistakably Anh’s own style. This book is also a departure for me, in that instead of working with independent publishers like Cargo, Freight, and Cranachan, we’ve published this ourselves through Amazon. It’s been quite a learning experience, and there were times when I despaired of how fiddly it could be, especially designing a cover with just paint.net as a tool (spine margins! argh!) but I think we’ve produced something we can both be proud of. And at least if anything goes wrong, we only have ourselves to blame!